Alison Sansone is a true Auntrepreneur. In 2007, Sansone was a PANK™ living in Southern California and working as a multimedia and video marketing executive. As a Long-Distance Auntie to her nieces, now 7-year-old Abby and 5-year-old Cassie, Sansone was looking for a way to stay connected through the art of storytelling. By late 2009, she boldly decided to take action, confident that her web and video marketing experience would help her formulate a successful business plan despite the tanking economy. "I knew that this would work," she said. "I knew my nieces would dig it." Sure enough, after a rocky road, Be There Bedtime Stories was born. An online interactive and rapidly expanding community of Aunties and Grandparents, the company offers a slew of adapted and original picture and story books that are sure to delight any niece or nephew. 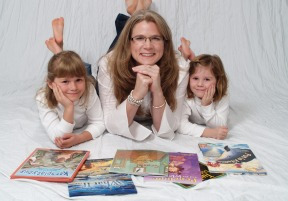 Many aspiring children's authors are trying their hand at self-publishing their own "Webtime Stories,"—or webcam bedtime stories to much success, according to Sansone. Webtime Stories offer some unique and story-specific advantages over other webcam alternatives like Skype and iChat. With Webtime Stories, an Auntie is able to create a record of themselves performing a story for their niece or nephew. "You can listen to the same story over and over again. It becomes a really unique keepsake." Sansone explained. One day, a child might even be able to experience a story told by an ancestor! Colorful and vivid visuals displayed on a tablet platform is another advantage Webtime Stories offer—no need to fiddle around with a physical book, when all the magic is splashed on screen. The advantages aren't just limited Long-Distance Aunties and family members, Be There Bedtime Stories offers a great opportunity for BenevolAunties as well. Along with their mission to support literacy in conjunction with Reach Out and Read, the company has formed a partnership with Blue Star Families, a national military family support organization. Through this partnership, users are able to donate Webtime Stories to military families who have loved ones overseas to help them stay connected—a truly unique way to support our troops! Engaging and innovative, Webtime Stories reminds us that storytelling is universal. Follow Alison Sansone on Twitter @betherecreator. Special Offer: Be There Bedtime Stories is offering Savvy Aunties an exclusive 50% discount on Webtime Stories! Just enter this Buy One Get One Free code at checkout: "savvywebtime" for unlimited use! Photo: Sansone and her nieces Abby and Cassie.